"Milton’s Industry: Our Industrial Past"
Location: Winchester Auditorium, Milton High School, 25 Gile Rd. The Milton Public Schools, in partnership with the Milton 350th Anniversary Committee, is proud to sponsor a evening of Educational History of Milton – The Students View. The evening will be a presentation of student work from each grade level across all six Milton Public Schools. Students have been working all year on projects ranging from research of the Bakers’ Chocolate Factory in Grade 3, to a Patchwork Quilt in grade 5 to a video produced by Milton High School students. There will be a reception to view student work with light appetizers and music followed by a one hour event with music, student presentations and a special guest speaker. We invite one and all to attend our tribute to the 350th Birthday of the Town of Milton. The award-winning Milton High School Orchestra will present an afternoon of popular music at the Brush Hill Road campus of Fuller Village. Under the expert direction of Dr. Noreen Diamond Burdette, this 40-piece orchestra will perform 20th Century favorites from Top 40, Broadway, the American Songbook and more. The concert is free. On Sunday, April 15 two ball games will take place between Milton High School and Milton Academy at Curry College in honor of the Town's 350th Anniversary. Girls Softball is scheduled for 9:30 AM and Boys Baseball is scheduled for 2:00 PM. This is the first time the Girls' Teams have met for the Town's anniversary celebration. The Boys Teams have met twice before for this purpose: in 1962 for the 300th Anniversary of the Town (final score: Milton High 6 - Milton Academy 4) and in 1912, the teams battled for the 250th Anniversary trophy with the prize going to Milton Academy (final score: Milton Academy 7 - Milton High 5, in 10 innings). Anniversary trophy will be presented to the winning team following the game. All concessions will be managed by Curry College for both games. The anniversary committee is very grateful to Curry College for facilitating these two important and historic events. The 350th Anniversary Bulb Garden is coming up and blooming in front of the Milton Public Library's new granite sign. The garden of 350 colorful red, yellow and orange bulbs is the work of the Milton Garden Club. Barry Driscoll Landscaping helped to prepare the bed and the bulbs were donated and planted by members of the Garden Club. The bulbs should be in full bloom (if all goes well with the weather) for the annual Garden Club Perennial Sale and the Mass Memories Road Show sponsored by the 350th Committee at the Milton Library on May 12. 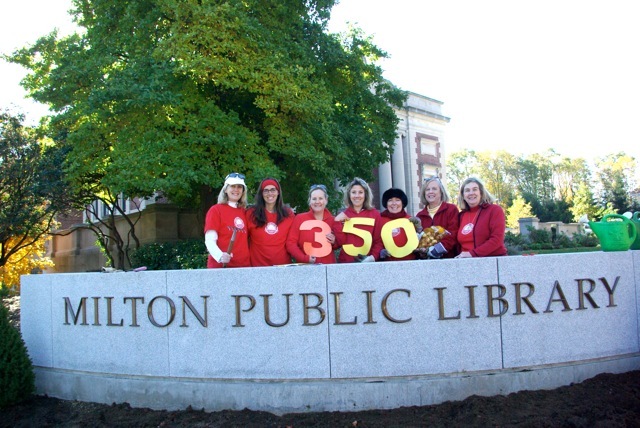 Until then, stop by the Library to enjoy 350 beautiful spring bulbs planted in honor of Milton's 350th Anniversary. Celebrate Patriot’s Day at the Open House at the historic Suffolk Resolves House. In 1774, delegates to the Suffolk County Convention came here to set the stage for Paul Revere’s famous ride and the Battles of Lexington and Concord. Gordon Campbell and other members of the 9th Massachusetts Regiment will perform drills and share what life was like in a colonial militia. This family event will give kids a chance to become historians, as they examine records of the historic events – heard round the world – of April 1775. There will be hands-on activities suitable for all ages. Bring your children and grandchildren so they can experience what life was like in the 18th century.